Welcome back to the Underworld, where we will be freeing a few famous souls at a time. This week, we get adorable teenage Hercules and his love Meg, with, as with most efforts on OUAT, mixed results. Let’s focus on the good: Sometimes, this show really nails it with the casting. Bailee Madison, who has been playing young Snow for years, does a commendable job this episode as the now-teenaged insecure young princess who fortunately meets a hunky Hercules to train her in the ways of being a badass. (She even perfects some of Ginnifer Goodwin’s mannerisms.) Despite a few necessary fumbles, and with a few assists from “Herc,” young Snow stares down the bandits that are raiding her village. She and Jonathan Whitesell are super-cute together, which makes it too bad that this is (likely) only a one-episode appearance. The Snow White-Regina flashbacks appear to be about as played out as they can get, so it was nice to get some new Snow perspective, and a taste of how she transformed the awesome Bandit Snow to someone who sits on a bed sulking in the middle of the Underworld. At least she acknowledges her own lame “speeches about hope,” and Regina offers an inspired missive about how unstoppably plucky Snow has been. Seriously, coming all the way around from hunting Snow down to palling around with her is quite a transformation, and it’s nice how Regina points that out here. And if letting go of her Mary Margaret self is really going to up things up for you, than godspeed, Snow. We need you to be less lame and more awesome, like, yesterday. Taking down Cerebrus is a decent start. Speaking of badaassery, you have to toss Hook a bit of respect for trash-talking Hades while he’s lying there, bloody on the floor. Although Hades is right: He’s a god, and there’s always going to be an Underworld, so really, what can Hook and his friends do to him? Eh, I’m sure they’ll come up with something. But after his death, and appearing in brief flickers on gravesites, it’s nice to even get a few scenes of bloody Hook, who’s still a brave hero even in the literal pit of despair. Out of the three villainesses’ arc last year, Cruella turned out, surprisingly, to be the most interesting one, going from an animated villain with a coat obsession to am actually evolved character due to her relationship with the author. Who among us did not groan when Henry broke the author’s pen in the first place? So now it’s a living entity, in the Underworld, of course. And Henry, even at his age should know better about keeping secrets from that particular crowd he runs with. How do you suppose it will all end, Henry? That gin line was pretty funny: Cruella’s the second person after Pan to point out how bland the Underworld is compared to the world above. I suspect we’re recycling episode themes at this point, but the importance of facing your fears can’t be overstated. Hercules’ unfinished business with Cerebrus (and Meg) keeps him stuck in Underworld. Snow’s continues attempts to stand up to the bandits finally earn her the respect of her villagers. In the end, these five are scarcely closer to finding Hook than when they arrived (so Rumple just went ahead and took that other boat back to Storybrooke, I’m guessing), although they’ve let two souls slip out of Hades’ fingers. But the lesson about facing your fears will probably come in handy more in the Underworld than anywhere. I liked the costuming tie between Snow White’s light blue omnipresent coat and the color of the cape her younger self wears. 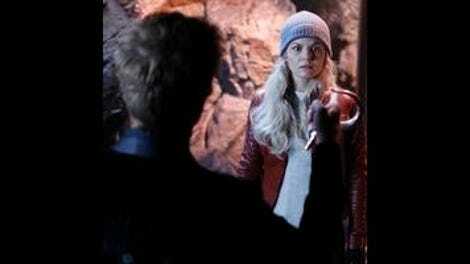 So did Neal get the message from Emma to Hook? Emma Caulfield is great but unrecognizable as the Blind Witch. OUAT’s makeup team is way too fond of eyebrow pencil and eye shadow. This episode was written by Andrew Chambliss, who wrote a lot of the bear stuff I wasn’t really a fan of in the first half of the season. He fares better here. Nice sight gag with Hercules carrying around whole anchors on the dock. “I think I know where you’ll wind up”: Good one, Henry! Also, “Since when are you practical?” Preach it, Regina. Hades is much more terrifying without the flaming blue hair. Greg Germann’s smarmy menace can stand on its own.